PILATES! hmmm…. Thinking about taking a class? Before you get started – there are a few things you might want to know. 1. Pilates is not a new fad exercise. Just because YOU recently heard about Pilates within the last few years doesn’t mean it is a new form of exercise. In fact, it’s pretty old – as in almost 100 years. 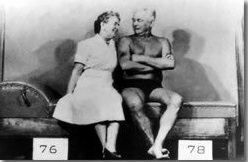 It’s named after a German guy- Joseph Pilates. He called his method of exercise ‘Contrology‘ and later, it became known simply as ‘Pilates’. Joseph started out kind of a sickly kid- asthma, etc. and developed a series of exercises in which he attributes to his healing and longevity. Later, he trained and rehabilitated soldiers, martial artists and boxers. I think, from looking at old films, I might have been a little scared of him. After he met his wife Clara he must have lightened up a little. In the 1990′s, celebrities and movie stars started making the exercise ‘secret’ more well known, and lo and behold, now it’s a household name. The history of Pilates is actually pretty interesting. Plus, I think it’s fun to look at all of the people working out in what looks like Speedos and bathing suits. 2. What’s the rush? Pilates takes time and patience. It’s a process. Would you expect to be good at golf the first time you tried? There are certain terms you will learn like ‘c’ curve and ‘neutral spine’. It’s literally a new language. Suddenly someone is asking you to move in a new way and it’s not so easy. Pilates is a life long exercise. There is no gold medal for finishing first. Advanced Pilates students still do ‘The Hundred’ – they just do it with more elegance and precision. you ready for group class in one session. I know people think instructors say this to ‘get more money’ but honestly , it’s for your safety. The problem with going to group class before your ready is when someone next to you does something you think ‘I can do that too’ – even though– your instructor has already told you not to do that exercise, and guess what? You get hurt and complain that “Pilates hurt your back/neck/. . .whatever”. 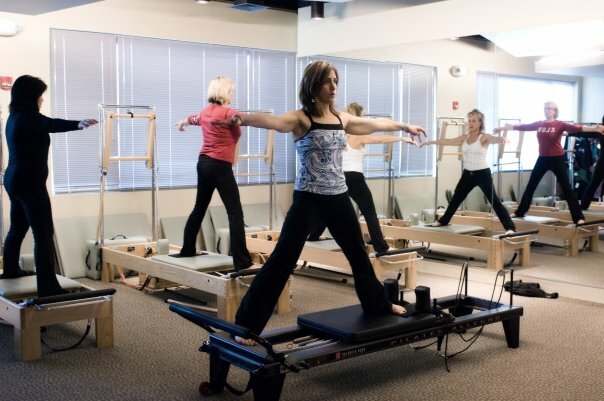 This is the main reason Studio Be Fairfax has the requirement of the ‘Intro to Pilates Package’ for all beginners – 5 sessions with a private instructor. Just cut out the lattes for a month and get some private lessons. Your body will thank you. And yes, there is the muscle-building factor. Pilates builds muscle, which burns more fat- blah blah, but let me tell you – and I am sorry to bum you out – you need some cardio exercise. Walk, bike, dance, do whatever, but you DO need something to light the fire. So, newbies, what are your questions about Pilates? Are you nervous? Inspired? Excited? Exercise should be fun- so don’t take yourself too seriously. Come in and join us at Studio Be Fairfax – we don’t take ourselves to seriously either – but we DO remember to breath!!! !